Adenomatoid tumor is a benign tumor of mesothelial origin. It is the most common tumor of the testicular adnexa (epididymis, spermatic cord and tunica albuginea). 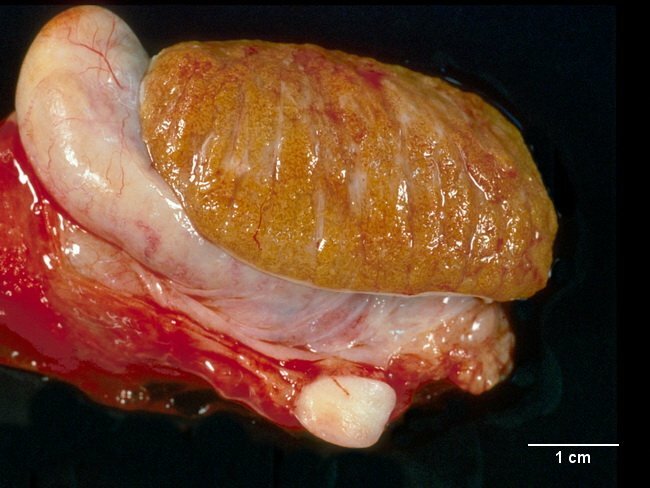 It may be asymptomatic or present as a painless slow-growing intrascrotal mass in the region of the head of epididymis or the lower pole of the epididymis (as seen here). Most patients are in the third or fourth decade of life. It is unencapsulated and usually measures less than 2.0 cm in size. Grossly, it appears well-circumscribed but shows infiltration at the margins into the surrounding structures microscopically. The cut surface is firm, white-gray and homogenous.